You may have noticed a newcomer to the aisles at Plum Market or Arbor Farms. Gleaming bottles of honey labeled Risk’s Apiary & Honey House or beeswax candles labeled Swarm Naturals now adorn the shelves. Angela Risk's (who runs Swarm Naturals) father-in-law is Mike Risk (of Risk’s Apiary & Honey House), who has been keeping bees for over 20 years. When Angela became a mom she decided she needed a hobby and she talked to Mike. Angela started making beeswax candles, balms, and lotions from Mike’s honeycomb. I first met Angela as a wonderful edition to the Westside Farmers Market and they are now selling their combined efforts all over SE Michigan. Visiting beehives in the winter is like visiting hibernating bears ~ not much is visibly happening, but there is a great deal one can learn regardless. 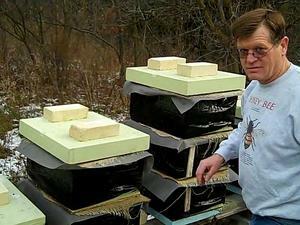 Mike Risk is the president of the Center of Michigan Beekeepers (COMB), the Lainsburg area beekeeping association. As a complete novice in the beekeeping world I felt I was being taught chopsticks by Mozart as Mike talked about breeding queens, Varroa mites, Nosema parasites, and Neonicotinoid pesticides. Mike explains that bees drink nectar and collect pollen into a pollen sac. Honey is made out of the nectar that has been digested and evaporated to below 18% moisture. Mike explains with a big smile and a rapt expression what he has witnessed. “At night you will see all of these bees lined up at the front porch of the hive. They will all be facing the same direction and fanning their wings to create a draft to evaporate the nectar in the hive.â€ His tone of voice echoed mine when I talk about my chickens thrumming in my arms. The honeycomb is the made from the nectar as well. The bees have 8 wax glands along the sides of their bodies. They create the mathematically perfect combs one fleck at a time. Pollen is turned into royal jelly, which is what is fed to a female larva to turn her into a queen. The queen lays eggs to populate and service the needs of the collective. She starts laying eggs in January to prepare for the season. As the one manning the booth at the farmer’s markets Angela smiles at this question. Mike replies. “If you have plant allergies that are a specific to a 2 mile radius around you than yes, you need bees to be making honey with that pollen - otherwise south-east Michigan has a very similar plant population.â€ When you process out the honey the pollen is removed through a very fine sieve. Mike Risk's honey is raw and unprocessed. It will crystallize below 55 degrees. He does not use any chemicals to maintain his hives and his bees are not fed high fructose corn syrup. The breadth of knowledge Mike has collected over his years of avid beekeeping and the depth of my own ignorance were complementary. 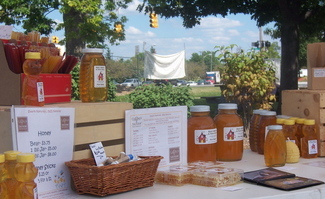 As more and more people start beekeeping in our local area (go Ypsilanti! ), I look forward to learning more. I also look forward to returning to Risk’s Apiary & Honey House in the summer to see the harvesting of the honey from their 50 hives and to see Angela turn their organic wax into candles for Swarm Naturals.